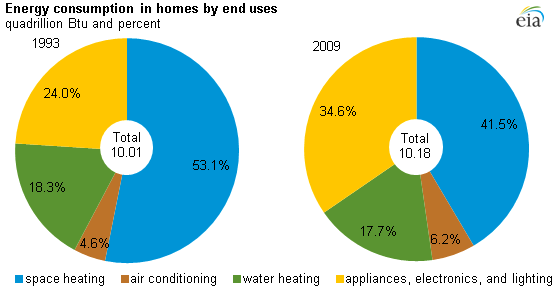 Source: U.S. Energy Information Administration, Residential Energy Consumption Survey. Note: Amounts represent the energy consumption in occupied primary housing units. While energy used for space conditioning has declined, energy consumption for appliances and electronics continues to rise. Although some appliances that are subject to federal efficiency standards, such as refrigerators and clothes washers, have become more efficient, the increased number of devices that consume energy in homes has offset these efficiency gains. Non-weather related energy use for appliances, electronics, water heating, and lighting now accounts for 52% of total consumption, up from 42% in 1993. The majority of devices in the fastest growing category of residential end-uses are powered by electricity, increasing the total amount of primary energy needed to meet residential electricity demand. As described in yesterday's Today in Energy, increased electricity use has a disproportionate effect on the amount of total primary energy required to support site-level energy use. In the past, EIA reported household energy data for the United States, for census regions and divisions, and for the four most populous states: California, Texas, New York, and Florida. In the 2009 RECS, EIA expanded the household data series to include 12 more states: Arizona, Colorado, Georgia, Illinois, Massachusetts, Michigan, Missouri, New Jersey, Pennsylvania, Tennessee, Virginia, and Wisconsin.